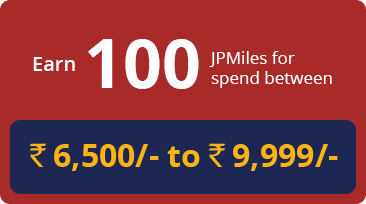 JetPrivilege is an award-winning loyalty and rewards programme and the frequent flyer programme of Jet Airways. Members earn great rewards and enjoy exclusive experiences every time they fly with Jet Airways, Etihad Airways and any of our 20+ partner airlines or transact with our 150+ programme partners across the globe. 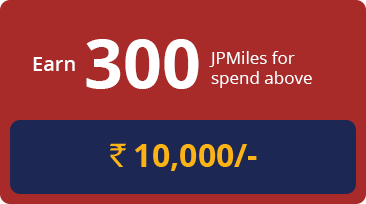 Members can redeem their accumulated JPMiles for Award Flights to over 1,000 destinations of their choice. In addition, members can avail unique across our 5 membership tiers: Blue, Blue Plus, Silver, Gold and Platinum. When members upgrade to the elite Silver, Gold and Platinum tiers, the privileges only get better. To step into a world of privileges and enjoy a truly rewarding experience, become a JetPrivilege member today! Minimum shopping should be billed on single transactions. Please show either your JetPrivilege membership card or an email/SMS from JetPrivilege indicating your JetPrivilege membership number, to the cashier before billing to avail the offer. 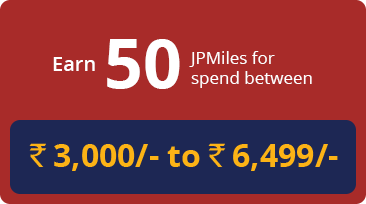 JPMiles will be credited to the JetPrivilege member's account within 45days, post purchase. Applicable for existing and new JetPrivilege Members, irrespective of the carrier flown.